For Tate Exchange, artist Tim Etchells has developed Ten Purposes, a set of instructions to carry out within and beyond the gallery. 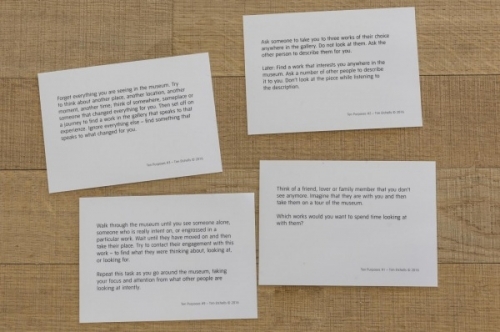 The cards suggest new ways to animate the building and explore the idea of exchange both personally and collectively, changing your relationship with art and each other. The ten cards are free, suitable for all ages and available to pick up from Tate Exchange on Level 5, Switch House, Tate Modern.